LAHORE, July 22: The Punjab Healthcare Commission mandate is apparently being encroached upon by the provincial government by launching ‘parallel’ investigations into the incidents of alleged medical negligence occurring in various hospitals of the province. The most recent example of this was handling of the case of deaths of three babies at the Children’s Hospital that is yet to be referred to the commission for a probe. 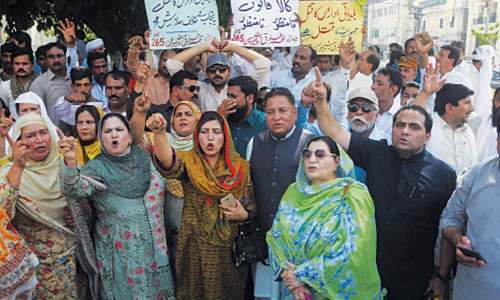 The affected families had blocked the Ferozepur Road on July 17 and alleged that the deaths occurred because of negligence of the doctors concerned at the Children’s Hospital. Two separate committees had been constituted – one by the health department and another by the Punjab government -- to probe into the incident. The PHC had to take ‘suo motu’ notice of the deaths and was awaiting the outcome of the inquiries by these committees before launching its own investigations, an official privy to the information told Dawn. According to the laid down procedure, the authorities were bound to refer cases of medical negligence to the PHC for thorough investigation. He said the parallel investigations and divergent inquiry reports on the same incident had been creating controversies in the past. He said in the wake of a series of medical negligence cases reported by the media during the last few years, the PHC ACT-2010 was passed by the Punjab Assembly to ‘ensure quality healthcare services and the well-being of the patients’. The commission was later declared an independent regulator of all the healthcare establishments at the primary, secondary and tertiary levels in Punjab, he said. He said a six-member PHC directorate was authorised to investigate the cases and ensure compliance with the findings. Headed by a director, the directorate was manned by two deputy directors and members. Interestingly, the official said, a committee comprising Children’s Hospital Additional Medical Superintendent Dr Ahsan, senior cardiac surgeon Dr Asim Khan and Dr Aslam Khan had declared the doctors innocent in their report the same day (July 17). Headed by Prof Amir Aziz, a senior orthopedic surgeon at a private hospital, another committee was formed by the chief minister the next day (July 18). Tahir Yousaf from the Chief Minister’s Inspection Team (CMIT) and Health Additional Secretary Azmat Mahmood as its members, the committee was tasked to determine the causes of the children’s deaths; to ascertain the element of negligence, if any, and to fix responsibility on the basis of their findings. It was directed to furnish its report within 48 hours which is yet awaited. In order to make the PHC fully functional, some relevant authorities and agencies had been barred in 2011 from initiating inquiries into the complaints of medical negligence and a categorical message was conveyed to them that their investigations would carry no legal value. The then inspector general of police, Javed Iqbal, had in December 2011 issued directives to all 36 district police officers in Punjab, the CCPOs and other police officers to avoid registration of FIRs against doctors in cases of alleged medical negligence. The IG had also directed the officers to refer such matters to the PHC instead of handling them at the police station level. The PHC was also bypassed in August 2012, when a medical negligence case surfaced at the Services Hospital where a 45-year-old man, Muhammad Asif, died during treatment. He succumbed to the multiple injuries he had suffered in a road accident on August 20. His family had blamed doctors for the death. At that time two committees were formed to probe the incident -- one headed by Prof Mahmood Ayaz, a professor of surgery at the Services Hospital and another constituted by the chief minister under Prof Syed Owais, the head of Orthopedic department at the King Edward Medical University. Interestingly, the findings of the both committees were different which triggered a controversy. Such cases stressed the need for an independent body to investigate such complaints exclusively. Similarly, in October 2011 a senior orthopedic surgeon of the Jinnah Hospital was accused of negligence when a woman died some days after undergoing a surgery at his private clinic. A former director general of the Punjab agriculture department was complainant in the case. The surgeon later rejected the findings of the inquiry conducted by a committee constituted by the then health secretary, Jehanzeb Khan, and sought another probe by the PHC. “We have taken notice of the incident at the Children’s Hospital and asked its management to submit report of its committee”, PHC Chief Operating Officer Dr Ajmal Khan told Dawn. He said the PHC started probe into a case when it was referred to it by relevant authorities or a complainant approached the commission with some concrete evidence. Dr Ajmal said no body filed a complaint with the PHC about the babies deaths and the Commission itself contacted the Children’s Hospital administration to get details of the matter. He said the chief minister had the authority to ask any department to conduct a probe into an incident.